I’ve admired Martha since I was a teenager, and had some of her early Chopin and Ravel recordings on LP. But I sold nearly all of my LPs in the late 1990s – after 3 decades of changing my residence every few years I became weary of carting them around. By that time I didn’t even have a working record player, and I had only been listening to CDs for more than a decade. So, many of the recordings in the new box set I had not heard before, and it had been years since the last time I heard many of those I already knew. A child prodigy, Martha Argerich was born in Buenos Aires in 1941, began to play the piano at three, and gave her debut recital at eight years old: concerti by Mozart and Beethoven and a Bach French Suite. Sponsored by (Argentine) President Peròn, her family moved to Vienna in 1955 so she could study with Friedrich Gulda. She in fact studied with several teachers before winning two major international competitions in 1957 (the Ferruccio Busoni in Bolzano, and the Geneva). 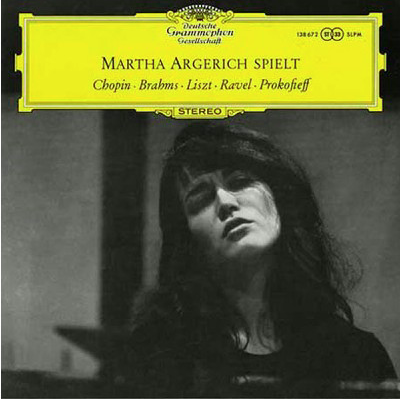 Martha began concertizing in earnest the following year and recorded her debut recital album for Deutsche Grammophon in 1960. Among the most legendary of her accomplishments is her 1st Prize at the 7th International Chopin Competition in Warsaw in 1965 – now referred to as the “Great” competition among piano competition aficionados. The Seventh Competition earned the nickname ‘Great’, on account of the particularly high standard of playing among the young pianists. And it was in that ‘Great Competition’ that a spectacular victory was carried off by Martha Argerich, defeating the runner-up Arthur Moreira-Lima. Observers were fascinated by Martha; she was ascribed great delicacy and subtlety, but also a strong, fiery temperament. The public called her by the diminutive name ‘Martita’. ‘In her quick, energetic movements, in her slender, shapely figure, there is something of a weasel about her’, recalled Zofia Jeżewska. The rivalry between Argerich and Moreira-Lima stirred huge emotions among the critics and the public, and certainly not everyone agreed with the jury’s decisions. Third place went to the excellent Polish pianist Marta Sosińska, who won the hearts of the audience even more by giving bravura performances despite being heavily pregnant. 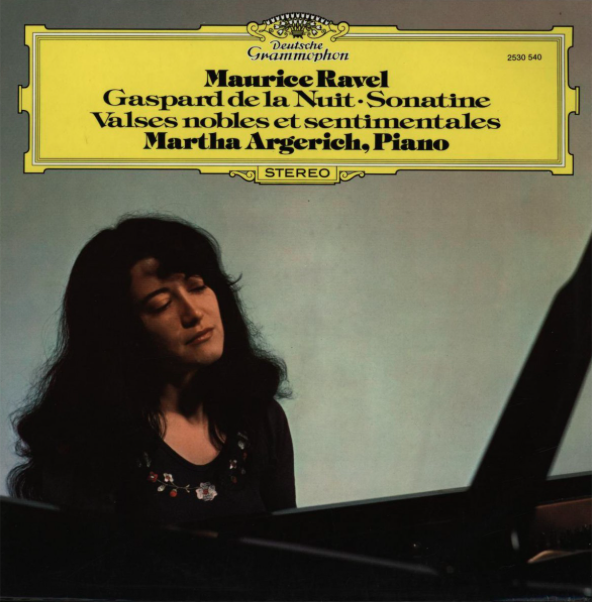 Martha Argerich performs Chopin’s Polonaise in A flat Major, Op. 53 at the 1965 International Chopin Competition. 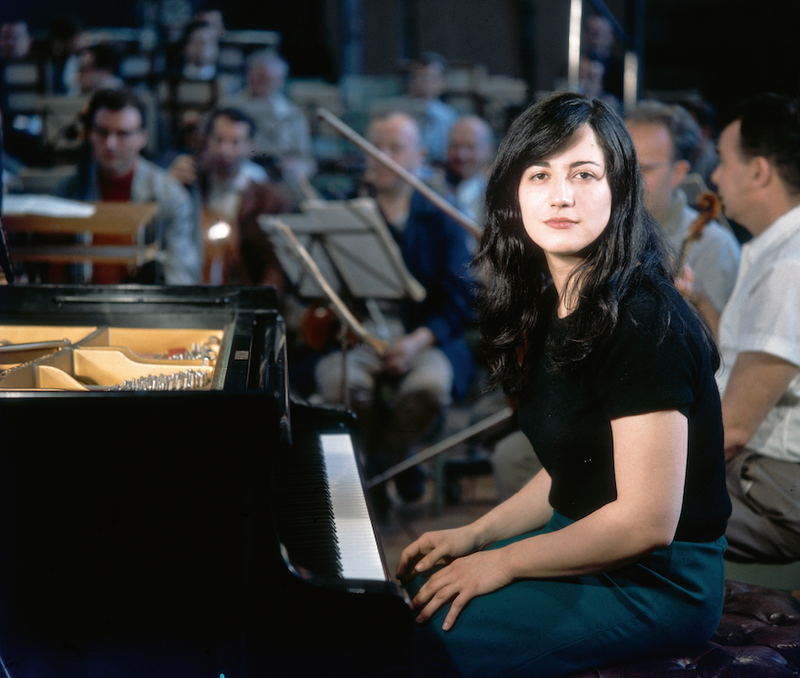 Really, Martha Argerich should need no introduction to music lovers – but there it is. Martha was and is a force of nature – not only is she a phenomenal musician with a photographic memory, legendary technical prowess, and a revered musicality, she is an astonishingly beautiful woman and has led a famously tumultuous life. I am going to leave all of that aside in this article, and just write about the music collected in these recordings. Read the entire track listing here on the Deutsche Grammophon website. The recording quality is uniformly excellent – even on the earliest albums – as is to be expected from Deutsche Grammophon. The collection comes in a handsome red box which is very nearly a cube, and each individual CD comes in a cardboard facsimile of the original album. Those who had the original LPs will remember that DG printed the “liner” notes in three languages on the back of the album cover in those days. Now that they have been shrunk down to the size of a CD sleeve and my eyes are decades older, I need my reading glasses to even attempt to decipher these. Thankfully, a substantial booklet with complete track listings, recording details, an essay and chronology of Martha’s life, and many photos is also included. Most or perhaps all of these discs can stand comparison as “authoritative” or benchmark recordings alongside those by any other artist. My one caveat is that Martha (and friends) on some of these recordings take fast movements at tempi that mortal musicians attempt only at great peril. It makes for thrilling music-making (as a listener!) although occasionally I found myself wishing she had played only a little slower in some concerti movements to allow secondary themes to emerge more from the texture. Martha’s solo CDs occur early in the set – she abandoned solo performance in the early 1980s and has performed chamber music or concerti almost exclusively for decades. Her final solo album – Schumann’s Kinderszenen and Kreisleriana – was released in 1984. The solo recordings are dominated unsurprisingly by Chopin, whose music is featured prominently on her 1961 debut recording, and exclusively on 3 subsequent discs. Martha’s Chopin albums are luminous and among the very best ever recorded – her 1977 recording of the Préludes is the finest performance of these pieces I have ever heard. Other composers featured on solo recordings include Brahms and Prokofiev (both only on her debut recital), Liszt, Ravel, and Schumann. A single solo recording released in 1980 features music by J.S. Bach: this superlative album includes a Toccata, a Partita, and an English Suite. The collection features multiple recordings (often separated by decades) of those concerti marked * in the list above, and are a mixture of live and studio recordings. In total there are 13 different conductors and 12 different orchestras featured on the concerti. Pride of place goes to Claudio Abbado, who conducts 10 of the concerti with 4 different orchestras over the course of her career: from Martha’s very first concerti release of Prokofiev 3 and the Ravel G Major released in 1967, to the pair of Mozart concerti they recorded at the Lucerne Festival in 2013. More than half of this collection is recordings of chamber music, which is one the best qualities of the box set – not only is Martha featured on every disc, but she makes music with some of the finest musicians in the world here. At the heart of this remarkable chamber music collection are the recordings she made with violinist Gidon Kremer and cellist Mischa Maisky – 7 duo CDs with each of these acclaimed musicians individually, and 3 more with them together in larger ensembles. 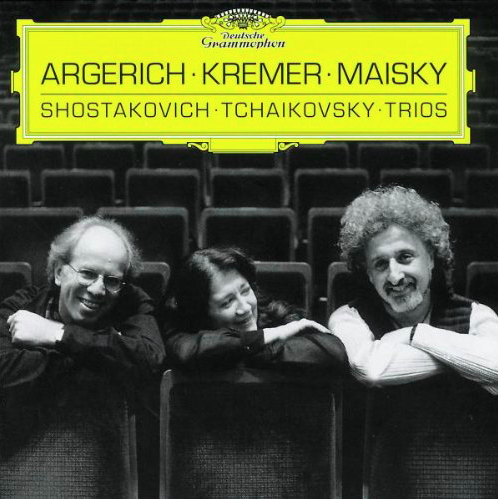 Among the chamber works Martha recorded recorded with Kremer and Maisky are music by J.S. Bach, Bartók, Chopin (of course), Debussy, Franck, Janáček, Messiaen, Prokofiev, Schumann, Shostakovich, and Stravinsky, but the shining jewels of all are their magisterial and authoritative complete cycles across 6 CDs of the sonatas for violin and piano and for cello and piano (respectively), by Ludwig van Beethoven. Another remarkable facet of the set are the recordings for piano duo or piano duet, 4 of which feature Martha’s lifelong friend, the Brazilian pianist Nelson Freire. An unusual array of seldom-recorded repertoire is here, including well-known piano duo works like Rachmaninov’s Symphonic Dances, Ravel’s Ma Mère l’Oye, Sain-Saëns’ Carnival of the Animals, Brahms’ Variations on a Theme by Joseph Haydn and his beloved Liebeslieder, Op. 52 for choir with piano duet, – as well as less-often heard arrangements of symphonic masterworks like Prokofiev’s Suite from Cinderella and Tchaikovsky’s Nutcracker Suite. I was frankly blown away by Martha and Nelson’s amazing recording of Rachmaninov’s Suite No. 2, Op. 17 for piano duo, an astounding performance of a fascinating piece I had never heard before. There are many gems like this to be found in this collection. One of the most touching is the live piano duo recital she gave with fellow Argentine music legend Daniel Barenboim in Berlin on April 19, 2014. She was 72, he was 71. Their performances of Mozart’s Sonata for 2 Pianos in D Major, Schubert’s Variations on an Original Theme in A flat major, and Stravinsky’s The Rite of Spring is at turns elegant, intimate, exhilarating, savage. Excerpts from Martha Argerich & Daniel Barenboim in recital, April 19, 2014, Philharmonie, Berlin. 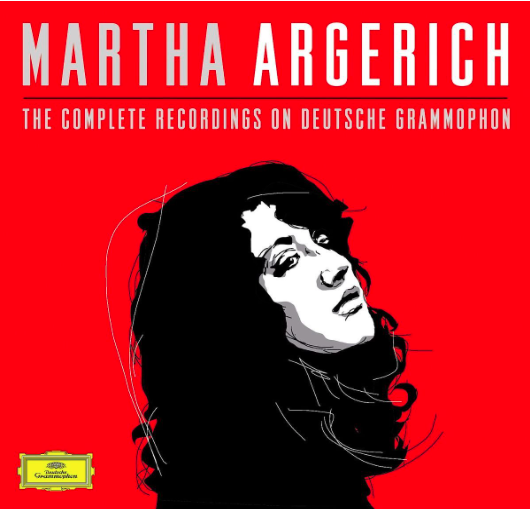 There are other Martha Argerich box sets available – Warner Classics released The Warner Classics Recordings, a 20 CD collection, and Sony released a 5 CD set The Complete Sony Classical Recordings. All three of these collections were put together to commemorate Martha’s 75th birthday. If you can only get one, get the Deutsche Grammophon. By walterbitner in Music, Orchestral, Piano & Harpsichord on August 11, 2017 . Great post. I had to laugh about finally getting rid of your vinyl collection after moving the LP’s several times. That was my exact experience, including the broken turntable. Who knew vinyl would make such a comeback–my daughter has picked up many bargains at the local Goodwill, the recipient of my collection many years ago–and that new turntables with USB outputs would be available. I made the same mistake with some of my books, many of which are now out of print. 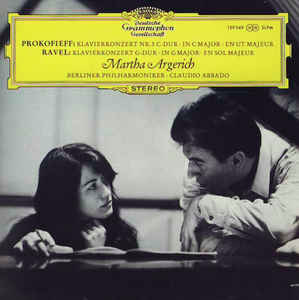 I have no knowledge of classical music, but will seek out these recordings by Martha Argerich.